LionsDeal > Catering & Buffet Supplies > Platters and Serving Displays > Plastic Serving Platters >< Tortilla Servers > Thunder Group NS608R Nustone Red Melamine Tortilla Server with Lid 8-1/4"
Thunder Group NS608R Nustone Red Melamine Tortilla Server with Lid 8-1/4"
Serve hot tortillas with the Thunder Group NS608R Nustone Red Melamine Tortilla Server with Lid 8-1/4". Manufactured from melamine, this server offers excellent heat retention so your tortillas will stay hot and fresh throughout the meal. In addition, it is dishwasher safe and tough enough to handle heavy use without chipping or cracking. 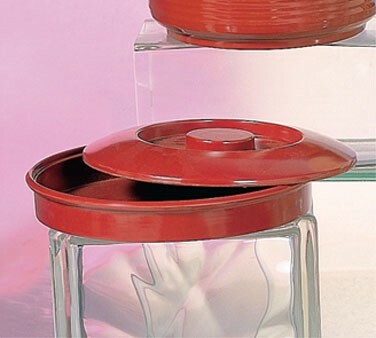 Designed with a bold red hue and a polished finish, this server is sure to add a stylish touch to any table setting. As an added bonus, it comes with a lid that offers a tight seal to keep food protected from airborne contaminants, while its rounded handle makes it easy to lift and maneuver.